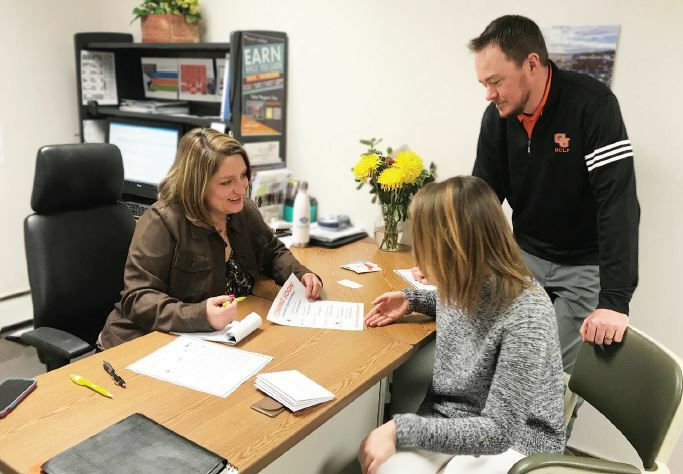 “Business led and student focused” is the motto of CareerWise Colorado as it seeks to place multi-year apprenticeship opportunities before students in School District 51 and across the state. The Chamber was one of the major supporters of this effort when Grand Junction was identified as a pilot site three years ago so it is no surprise that an MOU was recently signed with CareerWise to provide a full-time Chamber staff person dedicated to growing the program in our community. This even closer alignment between the CareerWise goals and the Chamber’s goal to help develop the skilled workforce needed for our businesses to grow will result in even stronger collaboration between programs and offer businesses a one stop shop for finding ways to assist in developing the existing and future workforce. Options range from a short-term job shadow for area high school students to three-year apprentice positions. Recently hired CareerWise Program Manager Jammie McCloud will be working closely with existing Chamber staff members CJ Rhyne, Director of Business Retention & Expansion and Darcy Weir, Workforce Development Coordinator. She may already be known to many Chamber members through her previous employment with Express Employment and Mesa Mall where she utilized her marketing ability and skills. CJ, Darcy and Jammie can help determine the needs for a specific business and assist them in accessing training programs, resources, and other workforce development partners in a wraparound approach. Those partners include School District 51, Western Colorado Community College, Colorado Mesa University and Mesa County Workforce Center. Click here to download the full version of the Grand Junction Area Chamber of Commerce February 2019 Newsletter.